Last week I missed scheduled workouts for Thursday and Friday. Work, home, tiredness — whatever. I didn’t get the workouts done. I did seven hours on the bike and three and a half hours running last week. How? One huge ride on Saturday and four runs. I meant for the week to be more run-centric than has been the case lately. Skipping bike workouts is the easy way to get there and it was easy to rationalize because I raced last Sunday. In fact, I raced yesterday and eight days ago. Yesterday was a 10 mile road race in light rain. I put up a race report here. The short version is that I started too fast, faded immediately for a half an hour, reached my pacing bottom at mile five before I was able to arrest the split free fall and then finished the second half well enough for a best time. It was ugly. A week ago, I showed up, went hard and turned in a best time at the Rumpus in Bumpass Olympic. Two weekends, two races, two good results and a couple weeks of falling short on planned workouts. Ah, it might be a wash except I met Elvis. He tipped the balance. More on that later. I switched my gels for the weekend. I’ve been using the Powerbar because of their title sponsorship of IMLP. A few months ago, Ironman announced that Gu gels would be on the course and so I dutifully purchased a bucketful so that I could get used to what would be available on race day. On a six hour ride across the Virginia and Maryland countryside — into the foothills around Frederick and Burkittsville, Maryland and Purcellville, Leesburg and Taylorstown, Virginia — I put down six Gu gels and three Powerbars. The Gu gels come out thicker than their Powerbar gel counterpart. As a result, they are hard to get down after a few hours. They nearly require chewing instead of slurping. On the upside, Patrick’s Garmin had us covering nearly 4,200 feet over the course of 113 miles. I swam yesterday. It was the first swim of the month if you don’t count the 1500 meters covered in the race last week. Because I felt so shelled from the bike ride on Saturday and the run in the morning, I opted to pull the whole main set of 5×500. The good news is that I descended the set. The bad news is that I started out with the first 500 taking 8:00. It too was ugly. All of this brings me to yesterday afternoon and my shoes. Early this year, I bought two pair of New Balance 1080s — one for the office and one for home. I noticed that the pair that now has nearly 150 miles on them had the tread separating from the foam cushion. Running the tread off of the shoe? I made a quick photo and a post to Twitter including the handle for New Balance, @NewBalance. Low and behold, the good people at NB sent me a message via Twitter this morning asking me to call them. Half an hour later and after visiting for ten minutes with a guy in customer service named Elvis, I am looking forward to a UPS label so I can return the shoes. Elvis says I’ll have a new replacement pair, courtesy of Customer Service, of New Balance 1080v2 shoes by the end of the week. I’m still waiting for the mailing label but have to say, I’m both surprised and really, really impressed. I’ll post an update later in the week or after I can test out the new shoes. Yesterday, my run was solid but didn’t deliver for the first half of the race. Later, my swim workout was not stellar. This morning, I struggled through the core strength workout and my legs were like pudding on the ride to work — a leg hangover from Saturday, no doubt. I was achey and basically found my schedule set with meetings from 9:00 through 3:30. Yet, Elvis made my day. Yay for Elvis! He won’t stand for shoes breaking down early. My first running shoes were Adidas Adistars. 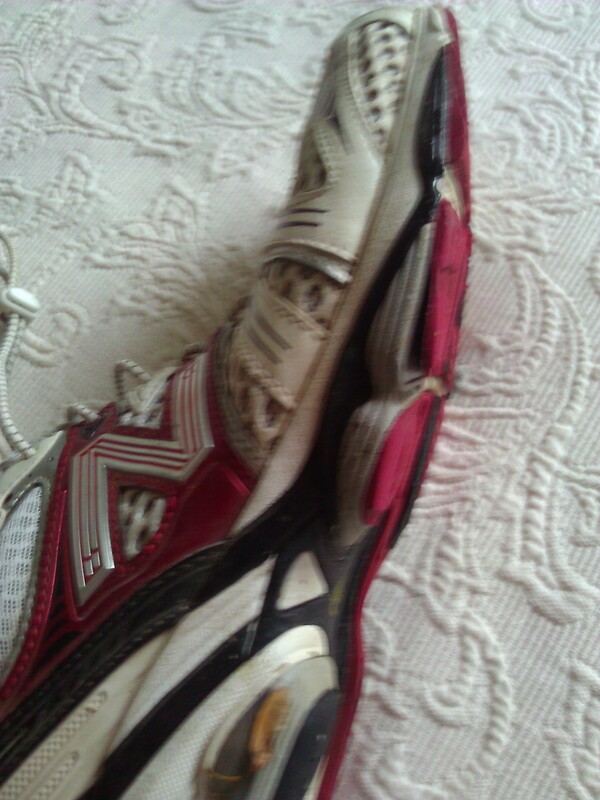 My next pair were New Balance and I’ve been wearing the same shoe — or its design successor — for half a dozen years. The shoes work for me and have helped me improve, lose weight and set a good example for my children. I plan to wear them at Lake Placid and somewhere in the back of my mind, I’ll know that Elvis is rooting for me.